If you are looking to eat inexpensively, few foods can beat the humble cabbage. It is so cheap, versatile, full of nutrition, and tasty. Cabbage also stretches a long way, as a half a cabbage can suffice for feeding a family of four. Pro tip: when planning your meals for the week, choose a large cabbage and have two meals include cabbage. This is called connected meal planning or having one food item do double duty in the same week. I love cooking cabbage with sausages, egg roll in a bowl, boiled southern style, as cabbage rolls or un-rolled cabbage casserole, or probiotic packed sauerkraut. 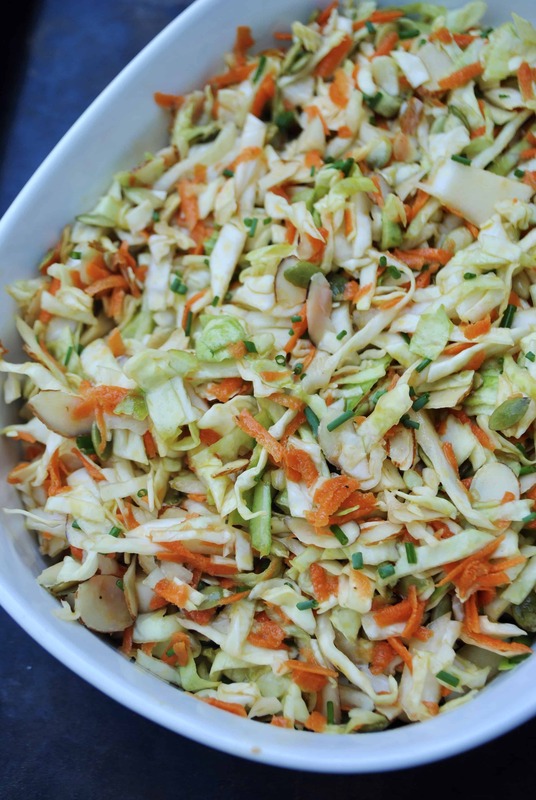 One of my favorite ways to eat cabbage in the summer though is in slaw form. 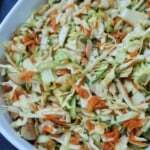 There is popular Asian cabbage salad or slaw that graced many a potluck table in my childhood. You may know that familiar slaw that includes Ramen noodles. I love that stuff, but don’t love the seasoning pack and noodles that accompany this dish. I wanted to recreate a real food Asian cabbage salad in a frugal healthy way. This is called an “Asian” cabbage salad, but truthfully in no way is this really considered an authentic Asian dish. It’s just a nod to Asian flavors. There are many more ingredients that you could add to this real food Asian cabbage salad, and feel free to add any that you wish, but these are the minimal ingredients that will still give you those familiar flavors while keeping food costs minimal. Other ingredients you could add: ginger, cilantro, red pepper flakes, honey, sesame seeds, or peppers. If you are on a tight budget, you can omit the sunflower/pumpkin seeds. You could also substitute another vinegar for the rice vinegar if needed. I would not sub the sesame oil though. It imparts an important flavor to the dish. 1. 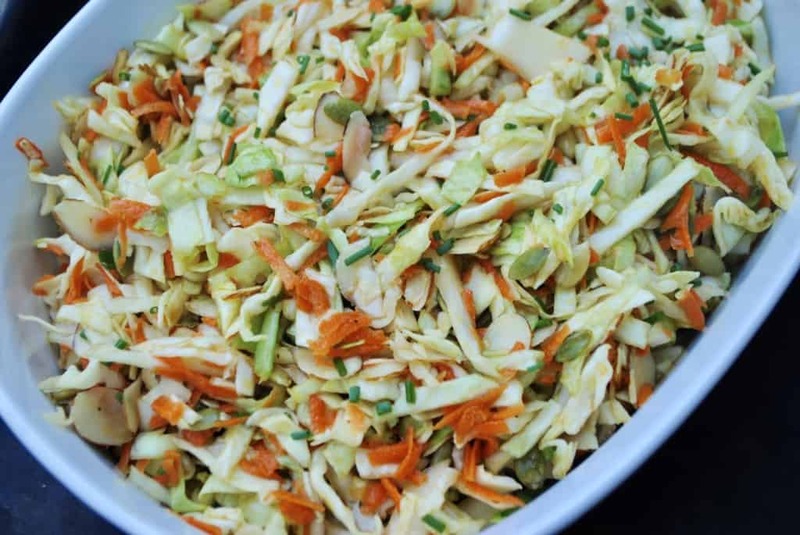 Mix together cabbage, carrots, almonds, green onions, and sunflower seeds in a bowl. 2. In a jar or a bowl, combine oils, vinegar, garlic, and coconut aminos. Shake jar or whisk in a bowl to make dressing. Taste and adjust seasonings if desired. Add salt, pepper, or honey if needed. 3. Pour dressing over slaw and stir well. 4. Taste again. Adjust seasonings if needed. Serve immediately or refrigerate until ready to serve. Coconut aminos is a soy sauce alternative that has less sodium, does not contain soy, and is a healthy alternative. It is sweeter and more mild than soy sauce. You can use a low sodium soy sauce in its place, but you will likely have to reduce the amount and possibly add a bit of honey to impart the same flavor.